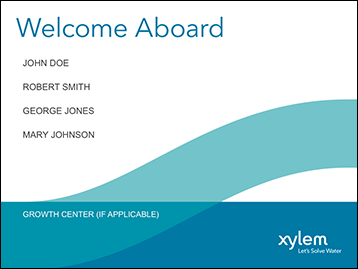 Welcome Aboard Signs | Xylem Inc.
Use the downloadable templates to create signs that acknowledge and welcome new employees to the organization. 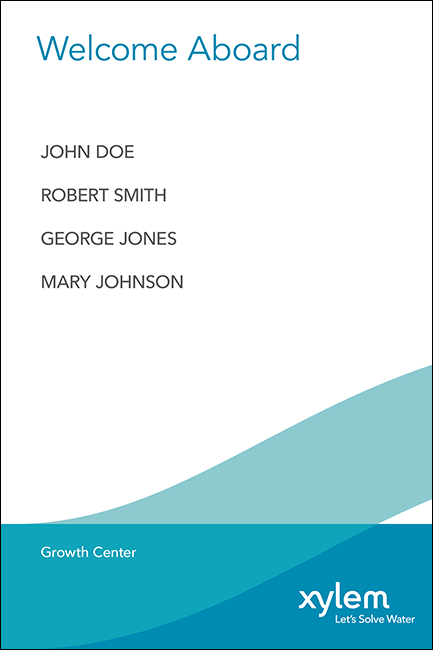 Templates are available in U.S. Tabloid and larger 24 inch (61 cm) by 36 inch (91 cm) sizes. 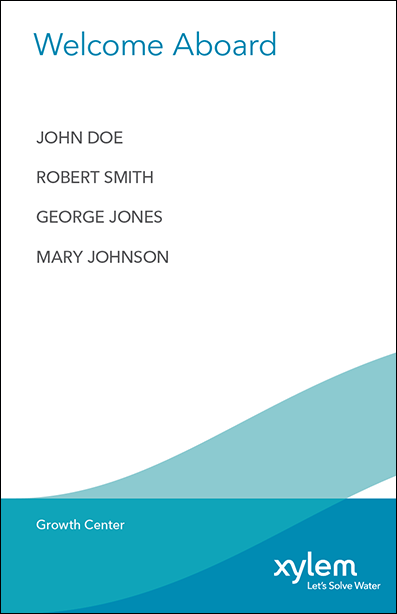 PDF forms that allow input of names and Growth Center are available in both sizes, and a Microsoft Word template is also available for the U.S. Tabloid size. Temporary signs can be printed and mounted on white foamcore or similar heavyweight display board. Some options for displaying the signs include mounting on a wall, attaching an easel back for counter or tabletop display, placing on a freestanding easel or any other predetermined method. You can also work with your facilities manager and local vendors to adapt the artwork into a more permanent fixture appropriate to your site. Use the supplied artwork to create signs with the suggested background art and capable of accommodating changing names. Sites with digital display capabilities may wish to use the provided Microsoft PowerPoint slide as an alternate way to announce new employees.